There are many valuable applications of conventional process analytics across industries. For years, so called core quality tools adopted by AIAG provide a platform for control and continuous improvement of different manufacturing processes such as painting and stamping, injection molding and casting, forging and assembly. Inadvertently, emerging tight-tolerance complex processes with perishable tools are also included into regulatory documents. Problems for manufacturers of precise machined components arise because of increasing gap between the limited potential of conventional distributional statistics and heightened demands for zero-defects quality and high production effectiveness. 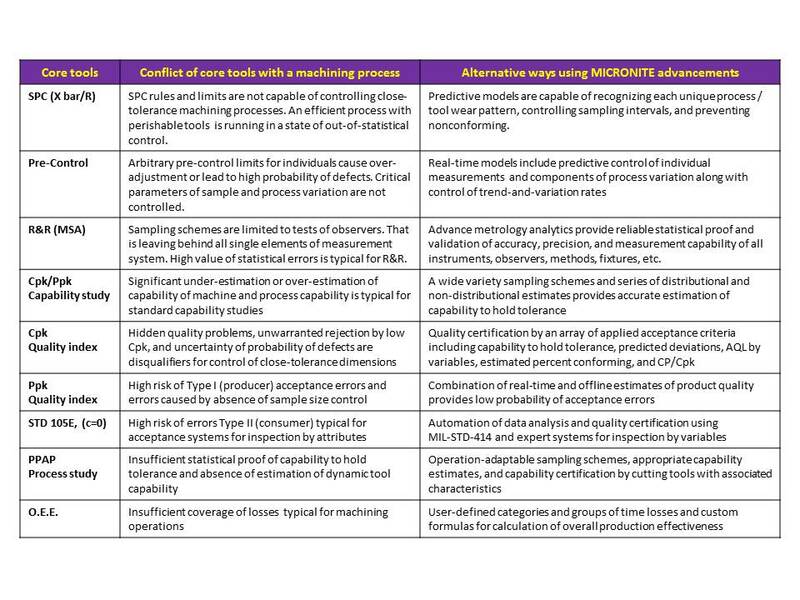 Majority of statistical procedures used in metalworking are outdated to the point where data capture is wasteful and data analysis is non productive. Indexes Cpk and Ppk, common measures of process capability and quality descend from critical to misleading when they are applied to modern high-precision machining and grinding. MICRONITE has taken the decisive step towards the modernization of methodology and analytical techniques for ultra-precision control of processes with perishable tools. Industry-leading advanced MICRONITE solutions impact the level and sustainability of process performance along with increase of production effectiveness. MICRONITE data analyses prove to be trustworthy for broad-scope applications that range from tolerance control of one tenth of inch to thousands, from five characteristics to five hundred, from short-term to long-term validation of process controllability, and from small-batch to high-volume production runs.